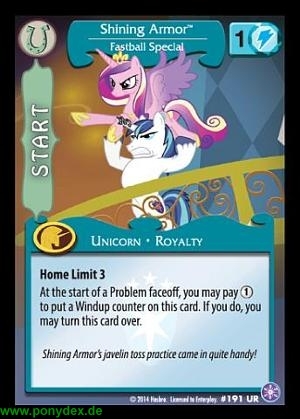 At the start of a Problem faceoff, you may pay 1 action token to put a Windup counter on this card. If you do, you may turn this card over. Shining Armor's javelin toss practice came in quite handy! When this side of the card turns face-up, you may move it to a Problem. Then, remove each Windup counter from this card and you may move a number of your Friends to this card's Problem up to the number of counters removed this way. 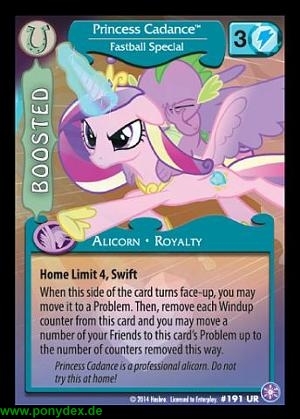 Princess Cadance is a professional alicorn. Do not try this at home!